The first step is often the most difficult. MEET BEN AND JUDY ADAMS, EXPERIENCED BUSINESS ENTREPRENEURS WHO TOOK A CHANCE ON A LIFESTYLE DECISION THAT’S REALLY PAYING OFF. 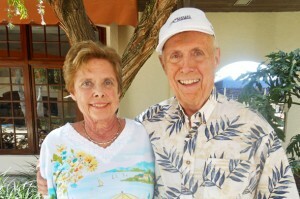 Originally from Skaneateles, New York, Ben and Judy Adams have been married more than 50 years. With Judy’s merchandising degree from Endicott College and Ben’s MBA from Syracuse University, they formed an enterprise specializing in women’s leather goods and accessories. Working with factories in Hong Kong, China, Thailand, and India, they traveled the world and grew their business to serve department and specialty stores as well as top catalogue houses. After retiring in 1996, they moved to Osprey, Sarasota. Judy loves to cook and play cards. Ben is a cyclist and stock market enthusiast. They fell in love with The Fountains and moved in October of 2014.